Here's a throwback for Halloween, from a time when I wrote a series of columns pairing wine and movies for Trailers From Hell, a really great website that all movie lovers should check out. They are kind enough to still have some of those chestnuts digitally preserved, which you can peruse here, if you wish. The holiday season doesn't really get going until we can hear the turkeys running for their lives. For those of us who live to pair wine with things, however, there's always a holiday just around the corner. Groundhog Day, Bastille Day, National Cheese Day - they are all perfectly good reasons to crank out - er, craft - an article on which wines will best complement the occasion. The annual, end-of-summer "drink that rosé before last call" columns are particular favorites of mine. Even Texas Independence Day - oh, hell, let's not go there again. Next on the list of official holidays is Halloween, a holiday which seems to get a lot of attention in Tinseltown. It may well be the worst traffic day all year in Los Angeles, especially in the late afternoon and early evening when the ghosts, goblins and Lady Gagas hit the streets to grab some goodies. A recent poll shows Halloween to be America's third favorite holiday, behind Christmas and Thanksgiving. Trick-or-treating may be for kids, but adults give it their best shots, too, with countless parties held for the purpose of answering the door and distributing hundreds of dollars worth of packaged tooth decay. I am assuming you're not one of those types who turns off the porch light and sits in the dark pretending you're not home. TFH Guru Adam Rifkin calls "Halloween" a cinematic game changer. After this one, just being scary wasn't enough anymore. If Jack-O-Lanterns didn't send a shiver up your spine before this film, they surely did afterward. Vampire Vineyards - This outfit has vampire-themed wines - and vodka - perfect for any occasion, but especially this one. Poizin Red Blend - It comes packed in a coffin. From the vault, this was done during a stretch of articles I wrote for the Blood of the Vines feature on TrailersFromHell.com. A special-occasion lunch calls for a special view, and that's what The Lobster offers in addition to the various ocean-going delights on the menu. Nearly all the tables are good ones from which to enjoy the beautiful Pacific Ocean as it churns toward the Santa Monica Pier. Look past the Ferris Wheel and the roller coaster - the Sigalert, as it's called - and you can commune with the waves while you dine. The wine list at The Lobster is not as inventive as I would like, but there's always something there that jumps off the page at me. This time it was the Drouhin Vaudon Chablis which caught my eye. The wine paired beautifully with my lobster and corn chowder with smoked bacon, and even better with the charred octopus, one of the best eight-legged appetizers I've ever had. The smell of wet pavement opens the experience, with citrus notes following. The palate offers the full set of flavors expected from the limestone-drenched origin of the grapes. A chalky, flinty sensibility carries the fruit and minerals along over a fine acidity which seems born for seafood. A special occasion is always made better with special company, and a special wine. During anniversary week for Denise and I (the 20th!) we had several special meals at places which mean a lot to us. The Beverly Hills Italian restaurant Da Pasquale is one of those places. Not only have we never - not once - been disappointed with a meal there, they seemed to put on an extra special table for our day. I wanted a Primitivo wine for that meal, but they said they were out of that variety. I shifted gears and took our server's suggestion that I try a different wine, and I'm glad I did. It's nice to have people around who are trustworthy. 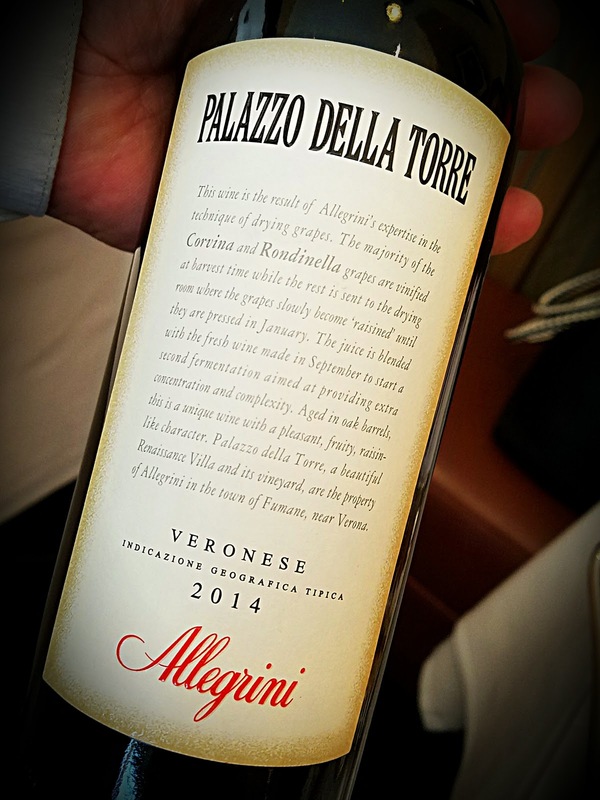 Allegrini's 2014 Palazzo Della Torre is a blend of Veronese Corvina, Corvinone and Rondinella grapes, with a splash of Sangiovese. Here's the twist: the winery says, "A small percentage of the harvested grapes are left to dry out until December and then added to the previously vinified fresh grapes." That gives a fleshy, meaty mouthfeel to the finished wine. You can't taste it, but the wine is named after what's called a "splendid masterpiece of Renaissance architecture now owned by the family." Aging went on for 15 months in used oak barrels, with another seven months in the bottle. Alcohol sits at 14% abv. It looks like it sells for about $20. The wine shows a bit hot on the nose at first, but settles down quickly. Aromas of stewed figs and red fruit come paired with autumn spices and earth. It's a hearty red, with red plums, cassis, and more spice on the palate. I paired it with pappardelle and lamb shank, to much delight. It also went well as a mate to risotto with beef and mushrooms. The Bodega Classica vineyards grow along the river Ebro in the Rioja village of San Vicente de La Sonsierra. They are not endless stretches of green, but hard-scrabble, rocky soil which forces the plants to dig deep for their survival. Along with the century-old vines are archeological remnants of winemaking which took place two-thousand years ago. The property is topped off by a castle on a hill. This Rioja red is made from three grape varieties: 90% Tempranillo, 5% Garnacha and 5% Graciano. The aging took place over a year in French and American oak with additional time in the bottle. Alcohol sits at 13.5% abv. 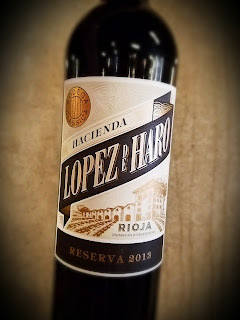 The 2013 Bodega Classica Lopez de Haro Reserva is medium dark in the glass. The nose is aromatic with violets, cigars, ripe plums and earth. On the palate, we find big, dark fruit, oak spice and a meaty black olive note. Tannins are firm and the acidity is lively, so it's great to sip as well as to have it with some steak. 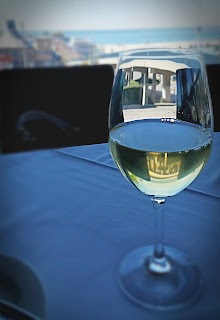 There's a lovely French restaurant across from L.A.'s Pacific Design Center which serves as a great place to grab a bite and a glass of something French either before or after. Zinqué has an open feel with lots of natural light in the daytime and a garden atmosphere all around. They have the 2015 Domaine du Trapadis Côtes du Rhône on the menu for $13 by the glass. I see it selling elsewhere for $38 per bottle. The wine is made by Helen Durand, and he uses his young-vine (average age 35 years) organically farmed Grenache grapes from Rasteau and Cairanne. He sees wine as a "photograph of an environment," a snapshot of the land, climate and cellar, taken by the hand of one person. The wine is fermented in cement tanks with extended maceration, then aged in those tanks for 18 months. The 2015 Trapadis Côtes du Rhône shows up dark, in the glass and on the nose. There's an earthy, Rhône-ish barnyard funk aroma that's extremely fascinating. The palate displays complex, dark fruit, with big notes of tar, plum and spice. The fruit gets plenty of play in this wine due to the concrete aging, rather than oak. The complexity does not suffer and the overall impression is extremely fresh. The medium firm tannins do what they are supposed to, nothing more, and the wine finishes nicely. 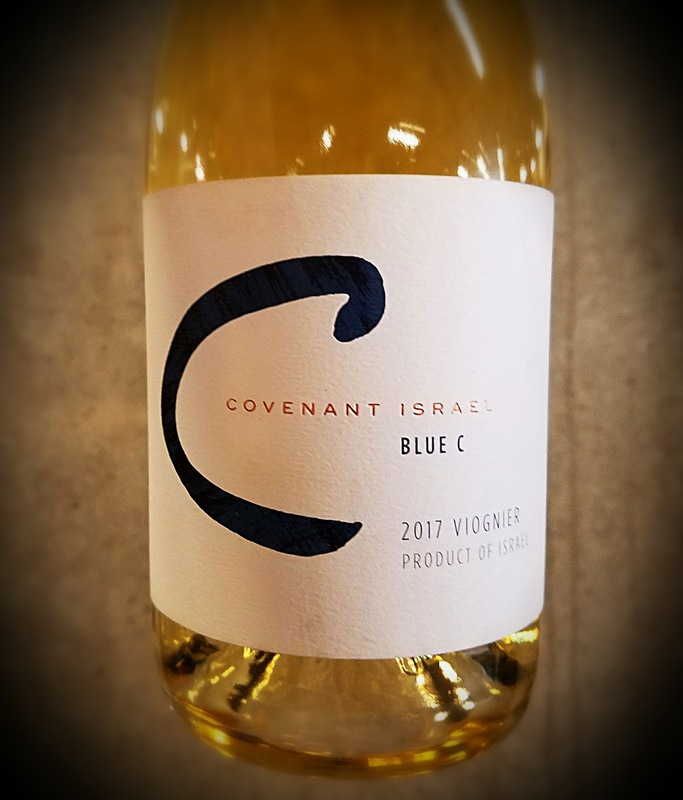 The Covenant wine label grew because two Napa Valley vintners wondered why they couldn't make a great kosher wine in the homeland of the Jewish people. Turns out, they could. Co-owners Jeff Morgan and Leslie Rudd were inspired by the many Israeli wineries and the terroir of the Galilee and Golan Heights. The landscape reportedly reminded them of both California and France's Rhône Valley. Unfortunately, Mr. Rudd passed away this past May after a battle with cancer at the age of 76. Covenant started out as a California wine, made in the cellars of Herzog Winery. It was in 2013 that Morgan and Rudd decided to more fully embrace their Jewish roots and expand to Israel. 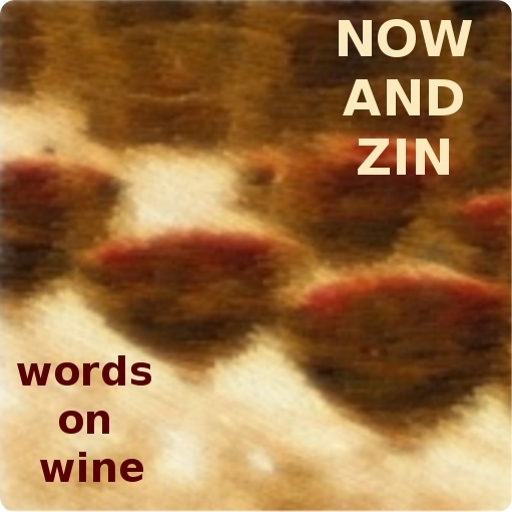 Neither had been an observant Jew when they got started in the winemaking business. The winery explains kosher wine by saying that "all wine is kosher. But because kosher wine is also a beverage used to sanctify the Sabbath and other holidays, it can only be handled in the cellar by Sabbath-observant Jews." The Covenant wines fit the bill. They are produced under rabbinical oversight. Viognier is one of the premiere white grapes of France's Rhone Valley, and it is also at home in the hills of the northern Galilee. This wine is sourced solely from the Manara Vineyard. It is made in a lighter style, and shows just light spice notes and restrained alcohol at 13.6% abv. 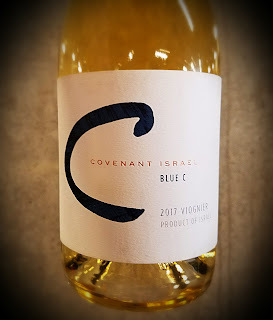 The 2017 Covenant Israel Blue C Viognier's pretty nose shows floral and mineral notes, with a lovely blast of mango and tangerine in the middle. The acidity is bright and fresh, but not strong enough to rip one's taste buds out by the roots. It's a weighty wine, with flavors staying along the mineral and citrus backbone. The finish is medium and pleasant. A recent virtual tasting event shone the wine spotlight on New Zealand, specifically Villa Maria winery. Winemaker Kathrin Jankowiec guided us through a half dozen of her creations and took a good look at their Taylors Pass Vineyard, on the north bank of the meandering Awatere River. I've never been to the land of the kiwi, but after checking out some images online, I'm ready to call Air New Zealand right now. Villa Maria was founded by George Fistonich in 1961 as a five-acre vineyard in Auckland. He and his wife ran the show themselves until he expanded in the 1970s. They now have estate vineyards on both the North and South islands. Auckland is a warm-temperate climate, with warm, humid summers and mild, damp winters. It's the country's largest population center. Gisborne is in the northeastern corner of the North Island and is also called the East Cape or East Coast. It's known for its warm summers and mild winters. Hawke's Bay in on the North Island's east coast. Long, hot summers and cool winters. Marlborough is located in the northeast of the South Island. It's New Zealand's sunniest spot. The Villa Maria winery here opened in 2000. The 2017 Villa Maria Bubbly Sauvignon Blanc hits only 12.5% abv and sells for about $15. I mentioned its bold qualities on Twitter, and the winery replied, "It's a great way to wake up your palate!" @IsaacJamesBaker noted the "green apples, white peaches, bell pepper, saline and nettle" notes. It's a bubbly Sauvignon Blanc, with small bubbles that vanish quickly but make the glass festive while they're there. The nose hits like a freshly mowed lawn, seeming even more pungent than a NZ SauvBlanc usually does, while the palate displays all the citrus zest and minerals one would expect from the varietal. Acidity is right at the top, as expected. 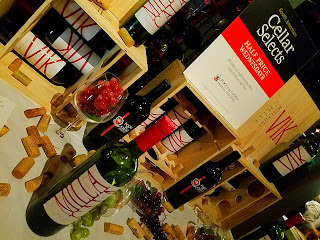 A recent virtual tasting event shone the wine spotlight on New Zealand, specifically Villa Maria winery. Winemaker Kathrin Jankowiec guided us through a half dozen of her creations and took a good look at their Taylors Pass Vineyard, on the north bank of the meandering Awatere River. I’m a full-flavor kinda guy most of the time, so I’ve always been most intrigued by the wines of the Kiwi. The Villa Maria wines fall right into my wheelhouse. 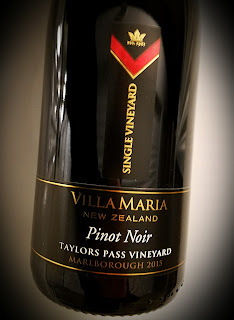 Villa Maria was founded by George Fistonich in 1961 as a five-acre vineyard in Auckland. He and his wife ran the show themselves until he expanded in the 1970s. They now have estate vineyards on both the North and South islands. Sir George was knighted by his government in 2009 for his service to the nation's wine industry. He took Villa Maria 100% screwcap in 2001. Auckland is a warm-temperate climate, with warm, humid summers and mild, damp winters. It's the country’s largest population center. This wine is made from a combination of grapes taken from throughout New Zealand's east coast. The grapes were gently crushed with some getting extra skin contact to release their color to the wine. The remainder were pressed "straight to tank." The wine is imported by Ste. Michelle Wine Estates and sits at a low 12% abv. This wine is nearly neon, the salmon pink-orange is so deep and rich. Its nose smells of strawberries and an overlay of herbal notes. It's not quite like Provence, but it's close. The dry palate is gorgeous, full of that bushel basket of strawberries and an earthy quality on top. The acidity is rather gentle so sipping it is recommended. However, it will pair nicely with salads and snacks. German wines tend to fall beneath the U.S. wine drinker's radar. Aside from Riesling, you'll be hard-pressed to find a German grape variety or even a German version of a more familiar grape, on a supermarket shelf. Specialty wine stores will dig deeper, but depending on their inventory they may not have a very wide coverage. With this in mind, I was thrilled to be asked to participate in an online tasting event involving German wines, with Matthew Kaner, wine director and partner at several wine bars in the Los Angeles area. Kaner says of the new world of German wine, "there's more than just Riesling," and he went on during the event to cover a Muller-Thurgau, a Pinot Blanc and a Pinot Gris as well as a Riesling. Another invitee, Dezel Quillen (@myvinespot) commented that he appreciates "the brightness, raciness, and lower alcohol levels in these wines. But those characteristics are trademarks of Germany's refreshing, cool-climate wines. Not to mention their food-friendly nature." He knows what he's talking about. Kaner spoke about German Rieslings, with their ability to age incredibly. He said they are "time capsules" that can age for a century and called them the "archetype of an age-worthy white wine." He also offered up an interesting tidbit for wine travel buffs, that the best way to experience Pfalz wine country is to "fly into Frankfurt and make the drive. It's quicker than LA to Santa Barbara." 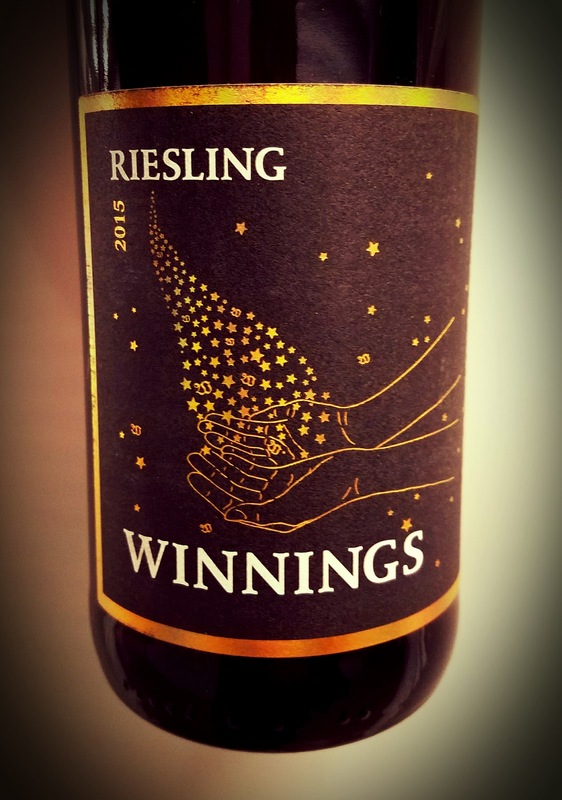 The Von Winning 2015 Riesling called "Winnings" is a good way to do just that. Imported by Skurnik Wines of New York, the Terry Theise selection scores big while delivering its attributes in a most understated way. The Von Winning Weingut has been around for awhile, since 1849. Leopold Von Winning really started the emphasis on quality wine in 1907, practically current times by European standards. The team is led today by Stephan Attmann, whom Theise calls an "obsessive winemaker" on the Skurnik website. The Von Winning grapes are farmed organically while the wines are fermented in oak barrels and handled as little as possible, often bottled unfiltered. 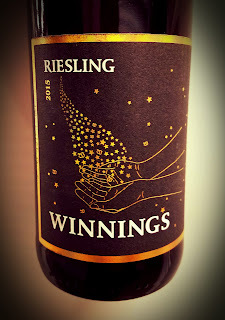 This Riesling from the Pfalz region hits 11.5% abv and sells for about $20. The 2015 Winnings Riesling shows a golden tint in the glass and a nose which makes me glad I inhaled. It's austere, with huge slate notes backed by hints of petrol that are starting to show and a whiff of citrus zest to finish off the scent. The palate is smart and savory, with a sedate acidity softened by the almost creamy mouthfeel. The finish stays long and leaves tangerine notes to remind the sipper of the pleasure. Welcome to Aotearoa - that's Māori for New Zealand - and the bold, delicious wines made there. 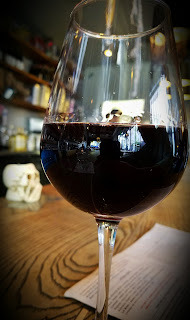 I'm a full-flavor kinda guy most of the time, so I've always been most intrigued by the wines of the Kiwi, which seem to leap from the glass both by aroma and flavor. 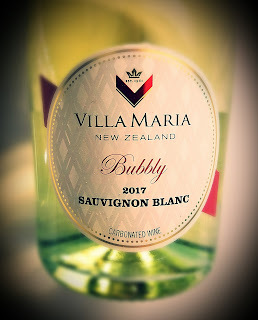 There's an online tasting session this evening featuring the wines of New Zealand's Villa Maria, which will feature winemaker Kathrin Jankowiec. It starts at 5:30 p.m. PT. You can no doubt keep up nicely on Twitter. 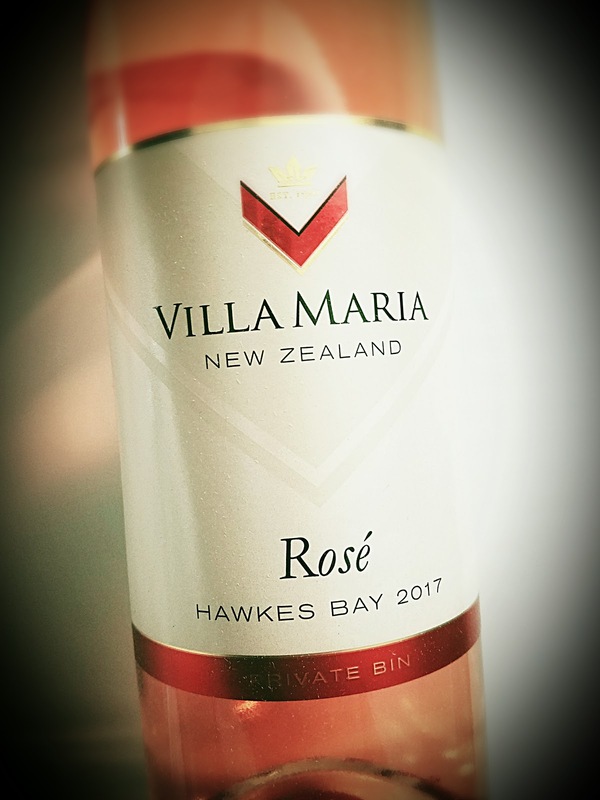 Villa Maria was founded by George Fistonich in 1961 as a five-acre vineyard in Auckland. He and his wife ran the show themselves until he expanded in the 1970s. Sir George was knighted by his government in 2009 for his service to the nation’s wine industry. He took Villa Maria 100% screwcap in 2001. Hawke’s Bay in on the North Island's east coast. Long, hot summers and cool winters. Marlborough is located in the northeast of the South Island. It's New Zealand’s sunniest spot. The Villa Maria winery here opened in 2000. The website description of the Taylors Pass Vineyard makes me want to get online with Air New Zealand right away. "Picturesque, on the north bank of Marlborough's meandering Awatere River." The vineyard consists of various soil types, from silty loam over gravels to deep, stony gravels. For this Pinot Noir, the single, destemmed berries are vinified to full malolactic fermentation and aged 16 months in French oak barrels, 30% of which are new. Alcohol sits at a very reasonable 13% abv and it sells online for about 45 bucks. This wine looks medium dark in the glass and smells that way, too. The nose boasts black tea and coffee notes, but not that elegant Burgundian stuff. It's the blackest tea and espresso that comes through beside black plums and berries. The palate shows big, dark fruit, too, and a bold cola note that's tinged by black cherry. Acidity is zippy and the tannins are firm, but it's Pinot all the way. I paired it with my wife's delicious sautéed mushrooms, and it was perfect. This is for everyone who loves Indian food, but hates the wine lists. There's a place that gets what sort of wines go with spicy, flavorful Indian cuisine. L.A.'s Badmaash brings astounding dishes to the Fairfax district with a wine and beer list to match. It's a super-abbreviated list, as it should be. It's a list that recognizes that if you want a high-alcohol, high-tannin flamethrower Cab, you're probably dining somewhere else anyway. Cardamom also offers a well-curated list of wines which pair well with the cuisine, but they do cave in and allow some big, oaky reds to sneak onto the page. Badmaash offers some truly inspired glasses, like a Riesling, or a Chardonnay by Sashi Moorman and Rajat Parr. And they have the curiously-titled "chilled red" that goes by the name of the Portuguese region where it was made, Vinho Verde. I'm familiar with Vinho Verde wines from Portugal, young whites designed to refresh, not to impress. However, I had never had a red one. Verde, of course, means green, but as it applies to the wine, green means young. 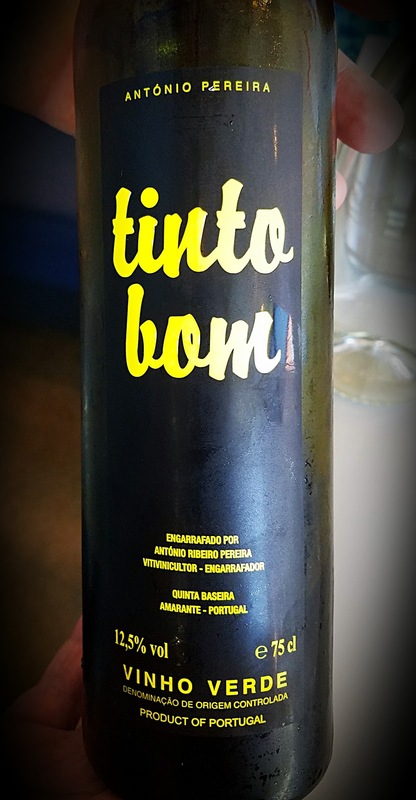 Tinto Bom red Vinho Verde is young, but unlike the white Vinho Verdes, it is actually aged several years. It's a perfect complement for an Indian meal. There's complexity and a great subliminal flavor that works with the food, but doesn't fight it. The tannins are very low and it's served chilled to maximize that effect. Alcohol is only 12.5% abv, and the price is usually about twice the white Vinho Verdes cost. Look to pay just under $20 a bottle. Antonio Ribeiro is the winemaker, and to my knowledge he's not the Antonio Ribeiro who played Carlton on Fresh Prince of Bel-Air. His Tinto Bom is made from Tinta Nacional grapes. It offers a grapey, earthy nose and a slightly fizzy appearance, much like Lambrusco. This wine has a complex palate of somewhat muted flavors, allowing the food to step forward and be the star of the show. Field blend wines are those for which various different grape varieties are grown and harvested together, then cofermented. 19th century winemakers found it advantageous to blend the wine in the field, rather than use separate barrels for each grape variety. Today's methods are more expensive, but more flexible Everyone likes a little nostalgia, though - that's why Throwback Thursday originated. In Sonoma County, Dry Creek Valley's grape history dates back to California's Gold Rush days. The valley is 16 miles long, two miles wide, and sustains 9,000 acres of vineyards. Many of those old vines are still around today. Talty Winery's vineyard was planted in 1963, but it was done in field blend style, as in the even older days. Located in Healdsburg, Talty is a small production winery which produces around 1,300 cases of handcrafted Zinfandels. Michael Talty's father William loved the Dry Creek Valley and wanted to start a winery there, a dream that was never realized. Michael saw to it and named the six-acre estate in his honor. The vines are head-pruned and dry-farmed in the heart of "Zinfandel Country." 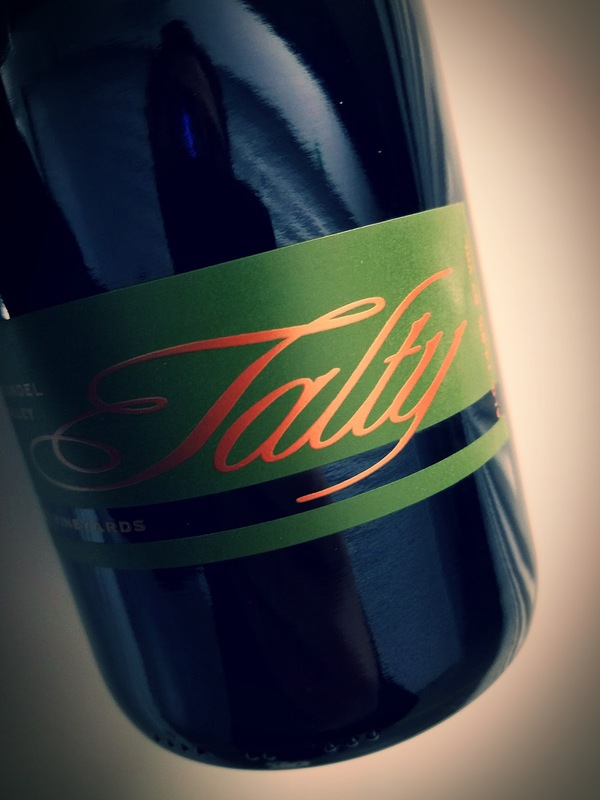 The Talty wines - all Zins - are aged a year in oak and a year in the bottle. 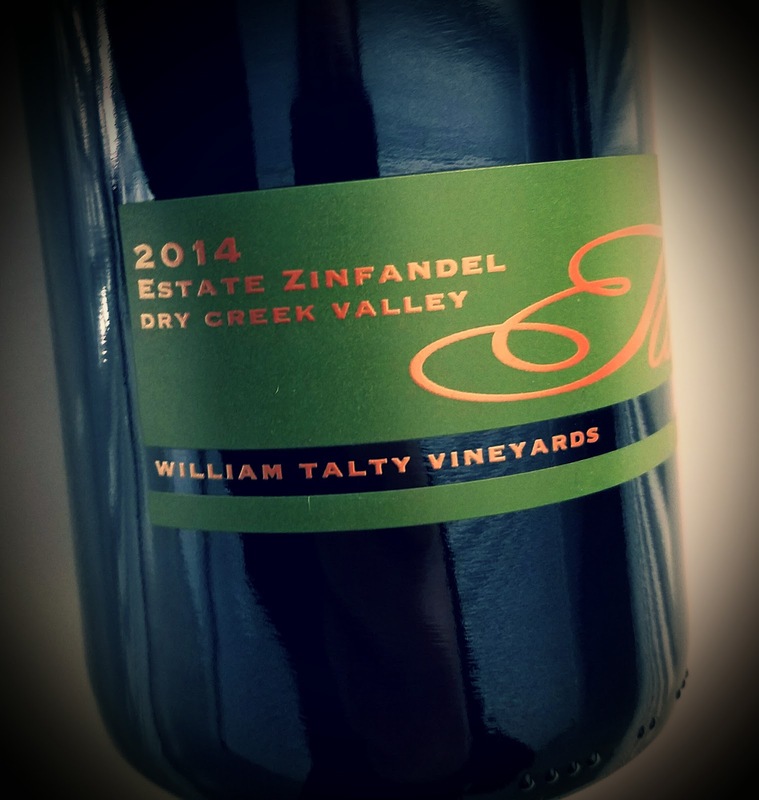 The 2014 Talty Estate Zinfandel, Dry Creek Valley is a field blend of 90% Zinfandel, 7% Petite Sirah and 3% Carignane. The grapes are harvested and vinified as a blend, just like the wine pioneers of California did it. 787 cases were made, the wine hits 14.5% abv and it sells for $42, which is about where all the Talty wines fall. The nose shows black cherries and currants surrounded by cedar, cinnamon and white pepper. Flavor is plentiful, with those cherries again, bolstered by ripe cranberries and blackberries. There's a leathery, sagebrush note that screams about the old west. The rusticity plays well with the overriding elegance of the sip, and it all melts into a long, savory finish. Media wine dinners - at least the ones I've been to - are usually on the small and somewhat boring side. The VIK dinner at Fogo de Chao in Beverly Hills was a party, a shindig, a gathering of dozens of people large enough to take up an entire half of the restaurant. And, it's not like I personally know everyone in L.A. who taps out words on wine, but I didn't see a single soul there that I knew. It was like I walked into the biggest after-work party at the most popular bar in town. VIK Winery - they pronounce it Veek - is a Chilean wine producer which is partnering with the Brazilian steakhouse chain to carry their line. Fogo already boasts that 60% of their wine list comes from South America, so this partnership will likely tip that number even higher. VIK employs a holistic approach to wine, in which they say the whole is greater than the sum of its parts. That sounds like fuzzy math, but I suppose Aristotle thought up the concept more as a philosophical thing, maybe after a night of heavy wine consumption. The idea works, of course, because all that plays into making a bottle of wine - grapes, weather, soil, altitude, winery condition, etc - contribute to what the wine is. Wouldn't you rather have the wine than just the weather? The CEO of VIK, Gaston Williams, was on hand to describe the wines and show off the beautiful images of the property in central Chile, north of the Rapel Valley. The winery has 11,000 acres among the vines and rainforests, and each one seems more gorgeous than the other. The winery says Norwegian entrepreneur Alexander Vik searched multiple countries for two years with a team of winemakers, climatologists, geologists and agronomists to find the perfect spot for his dream of a world-class winery estate. 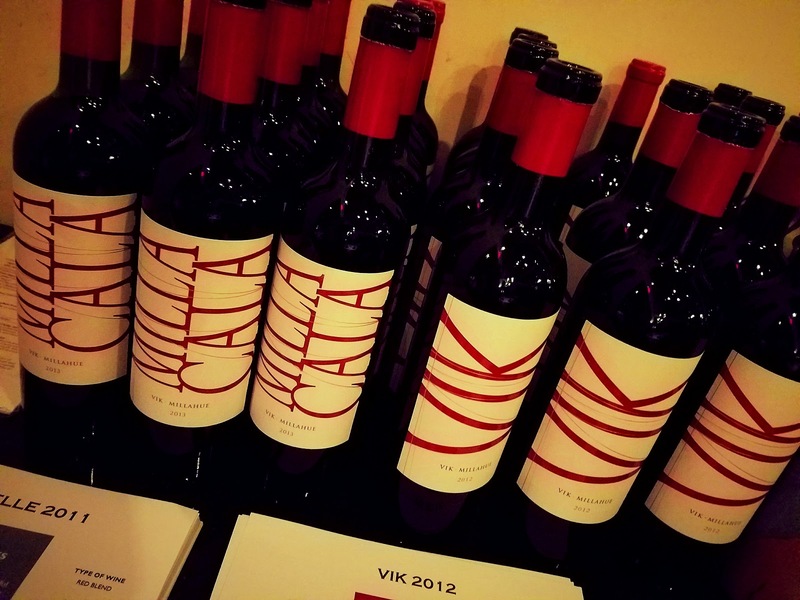 VIK was founded in 2006, and winemaker Cristián Vallejo brings together the different parts into the whole that is a great bottle of wine. The three wines VIK produces all feature Bordeaux grapes - Cabernet Sauvignon, Carménère, Syrah, Merlot and Cabernet Franc - that are blended in a different mixture each vintage. Williams called the three styles by human descriptors. He said La Piu Belle is the lady, Milla Cala is the man and VIK is the cowboy. La Piu Belle retails for $75 and is their mid-line offering. It has a beautiful nose of violet, cassis, nutmeg, allspice and vanilla. There's a light touch oak, but it's definitely there. The palate shows great dark berries, sweet cranberry and blueberry with firm tannins and a great finish tinted by cranberry. To help match up with the descriptor, there is a woman on the label. Milla Cala - the man - offers a floral nose, too, but lighter and with a bit more oak. More berries here, with a slightly herbal backbeat on the finish that I found irresistible. The tannins aren’t as forceful, so this is the one if you just want a wine to sip. It has a retail sticker of $39. VIK - the cowboy - shows more oak and fruit on the nose and turns in a big and bold mouthfeel. This is the steakhouse wine. Retail price $140. We've all been in situations where there's no bartender and one is badly needed. Airliners, hotel rooms, seventh-inning stretch. A Southern California booze company has come to the rescue. The company operates out of West Hollywood, and I ran across their tasty bottles at The Cocktail Lab, also in Los Angeles. BTL SVC says they make "classic cocktails taste as good as you can get at your favorite bar," and that's right on the money. The company has their product in many good local wine and liquor stores and a smattering of L.A.'s ritzier hotels. BTL SVC makes such bottled delights as a Gin Martini, Negroni, Manhattan and Old Fashioned. If you’re looking for something really different, they have a Ginger Buck, 1934 Cosmo, Matador and Spicy Maid to offer. Nathan Oliver is the Master of Cocktails for BTL SVC, described as "a well respected artisan in the world of mixology." His decade behind a bar produced the classic recipes used for their drinks. The drinks are a little smaller than I would make at home, but I find that's the case in bars, too. Each little bottle costs $12, less than what I generally pay for a cocktail in a good Los Angeles bar. The taste is great for the Martini and the Negroni, and I'm still working my way through the others I bought.